A Czech fugitive living in South Africa nearly met his end in bizarrely James Bond-like fashion when he was fired upon by a Volkswagen CrossPolo that packed machine guns behind its rear license plate. Seriously, this is a thing that actually happened. The Associated Press reports that on Wednesday in Johannesburg, Czech fugitive Radovan Krejcir stepped out of his Mercedes-Benz at his office building only to be met with a hail of 5mm bullets coming from the nearby Volkswagen. The car was mounted with a dozen gun barrels operated by remote control. Krejcir was miraculously unharmed, having ducked behind his bulletproof Mercedes. 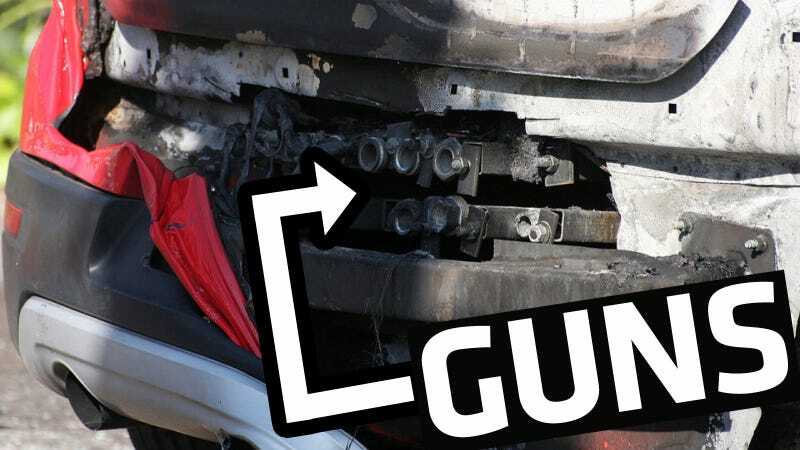 In what is perhaps a testament to its non-Q Branch shoddy build quality, or an intentional attempt to erase evidence, the Volkswagen caught fire and nearly burned to the ground. Krejcir told news sources that he does not know who wanted to kill him, but it's nothing too out of the ordinary in his daily life. "All my life is like James Bond stuff," Krejcir said with a chuckle in an interview with Eyewitness News, a South African media outlet. "That's how I live my life." And who might want to kill him? At first, Krejcir reportedly said he didn't know. Then he said that if he had any theories, he wasn't saying. Okay then. According to the AP, he was sentenced last year in the Czech Republic to 11 years in jail for tax fraud, but currently lives as a fugitive in South Africa. He has been linked to a number of underworld figures there, the news story says. I'll bet you'll never look at small Volkswagen hatchbacks the same again.